At the Dem. debate Hillary, Obama, & Edwards said they could not have the troops out of Iraq by 2013!!! CAN’T THEY JUST BRING THEM HOME, LIKE THEY DID FROM VIETNAM IN 1975???? Underwhelmed by the Dem. front runners, I prefer underdogs like Kucinich. We saw Dennis K. on a plane in 2004. JL, my audacious companion, told him that he liked what he had to say-but-GET A BETTER TAILOR!!! 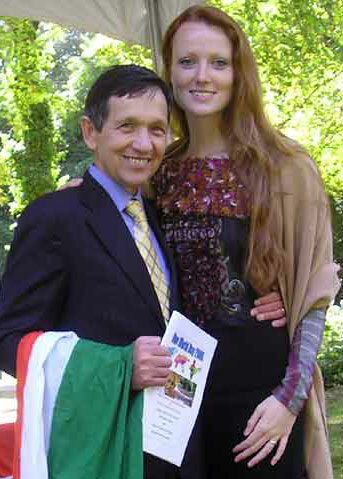 I think vegan Kucinich took his advice. He looks pulled together & managed to snag a hot young bride–a statuesque and classy-looking Brit, 30 years his junior. Actor/candidate, Fred Thompson, also has a much younger wife–a one-time Rep. flack who goes for the bimbo look. It seems they are ramping up in the Middle East, w/ a contract to buy 50 more of the hybrid (not gas/electric, silly…helicopter/aircraft) V-22 Osprey @ $89-100 million each. Controversial, it has been around for a long time & has a spotty safety record. The Pentagon wants a total of 458. Sweet contract for Boeing-Bell !!! Went to Torafuku, a great Japanese restaurant on Pico near Westwood… then upstairs to the new Landmark Theaters to see Iraq documentary, No End In Sight. It was sold out. Instead we saw 2 Days In Paris w/ French star Julie Delpy, who has worked in American productions. Delpy was not just the star but producer, director, writer, editor, composer & she sang the theme. I liked it. This is a real accomplishment by Julie Delpy. She’s like a good-looking, female Woody Allen or Larry David. Adam Goldberg as the beleaguered American boyfriend was also very good.